A simple rain barrel with intake from a downspout (top), a drainage spout (bottom), and an overflow spout (side). What is a rain barrel? A rain barrel can be any large container designed to collect rain water. Typically, rain barrels are placed at the bottom of downspouts in order to collect rain as it runs off of a roof. For every inch of rain that falls on 1,000 square feet of roof, about 600 gallons of water can be collected. Typical features of a rain barrel include a reservoir to store water, a mesh screen, lid or filter to prevent organic matter and insects from contaminating water in the barrel, spigots for easy drainage, valves that can be used to connect multiple barrels together with hoses, and overflow valves designed to direct excess water away from water sensitive areas (e.g., a house foundation). What are the benefits of rain barrels? The primary purpose of a rain barrel is to provide homeowners and gardeners a source of soft, slightly acid water that is typically preferable to city water (which may be chlorinated) or well water (which may have excessive mineral content) for irrigating woody and herbaceous ornamentals, as well as lawns. 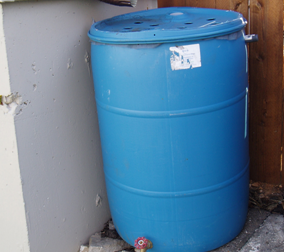 Rain barrels can also reduce the potential for basement flooding by directing water away from house foundations. In addition, rain barrels reduce the amount of water running into lakes and rivers, thus reducing erosion and helping prevent storm water pollution of lakes and waterways. Rain barrels work particularly well on smaller properties where plants can be watered directly from a barrel using an attached hose. Due to possible leaching of chemicals and microorganisms (e.g., bacteria and fungi) from roofing materials, rain barrel water is not recommended for use on vegetables, or for human consumption. Rain barrels are not recommended for homes with tar and gravel roofs, or roofs made of asbestos or treated cedar shakes shingles. Where can I get a rain barrel? Pre-fabricated, ready-to-use rain barrels are available at many garden centers, as well as hardware and home improvement stores. Alternatively, you can save money by making your own rain barrel. Materials for constructing home-made rain barrels generally cost $50 or less. Reconditioned or recycled food-grade plastic barrels (approximately 55-60 gallons) often work well. These barrels typically have either secured tops or removable, screw-off tops. Local food processors and distributors frequently sell these types of barrels at relatively low cost. Check for sources of these barrels in the Yellow Pages, online, or in the newspaper classified section under “Containers” or “Plastic Barrels”. Once you’ve acquired your barrel, clean the inside of the barrel and lid with a mild soap and water, and rinse thoroughly. There are a variety of methods for modifying your rain barrel depending on your site conditions and use of the barrel. First create an opening for water collection. This can be as easy as cutting a large hole or several large holes in the top of the barrel and covering the hole(s) with a screen or filter to catch organic matter (e.g., leaves or other plant debris) and prevent insects from entering. Alternatively, you can cut a hole the exact size of your downspout and secure the downspout directly to the barrel. Next construct an overflow valve on the side of the barrel near the top. An overflow valve is critical to redirect water during periods of heavy rain and when the barrel is full. Use a spigot or barbed spout and hose, or attach a downspout elbow and flexible downspout to the barrel to guide excess water away from the barrel and any water-sensitive areas (e.g., a house foundation). Add additional spigots and hoses at the top of a rain barrel to connect several barrels together to maximize water collection. Also attach a spigot a few inches from the bottom of your rain barrel that can be used to drain the barrel. Seal all fittings and spigots with caulk to minimize water leakage. Finally, consider painting or otherwise decorating your rain barrel to make it a distinct and attractive part of your yard or garden. How do I install my rain barrel? 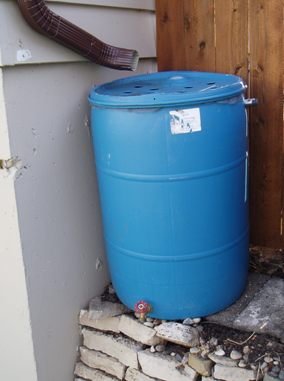 Rain barrels should be installed only on level surfaces and elevated using concrete or cinder blocks, or a sturdy wooden stand. Elevating a rain barrel helps to increase pressure, and thus flow when emptying the barrel. Barrels must have a secure base to prevent tipping. Fifty gallons of water weigh several hundred pounds, and may be a risk to children if they try to climb on the barrel and the barrel tips. How do I care for and maintain my rain barrel? Most problems with rain barrels can be easily avoided if water is not allowed to stand in the barrel for more than five to seven days. Mosquitoes are a frequent concern with rain barrels as these insects breed in stagnant water. A fine mesh screen or filter fitted to the lid of your rain barrel will prevent adult mosquitoes from gaining access to the barrel and laying eggs. If you opt not to use a screen or filter, you will need to completely empty your barrel every week so that mosquitoes do not have time to breed. Growth of algae may also be a problem if rain barrels are placed in direct sunlight. If algae become a problem, empty the barrel and then wash the barrel with a dilute bleach solution (3/4 cup of bleach per one gallon of water). Rinse the barrel well after bleaching and dispose of the bleach water in a household drain. Also be sure to regularly clean the screen on top of your rain barrel to ensure that no organic matter blocks drainage. Finally, in the fall, disconnect and drain your rain barrel to avoid freezing and cracking over the winter. Remember to reconnect your rain spout in order to direct water away from your house foundation when your rain barrel is not in use. For more information on rain barrels, or related topics such as rain gardens or storm water management: See http://clean-water.uwex.edu/pubs or contact your County Extension agent.